Here's two special birthday cards I made recently, one for the young girl who leases my horse (Wrangler) and one for my grandpop! They both used the same sentiment stamp set (one of my favorites) and have similar color themes, so I thought I'd share them together. 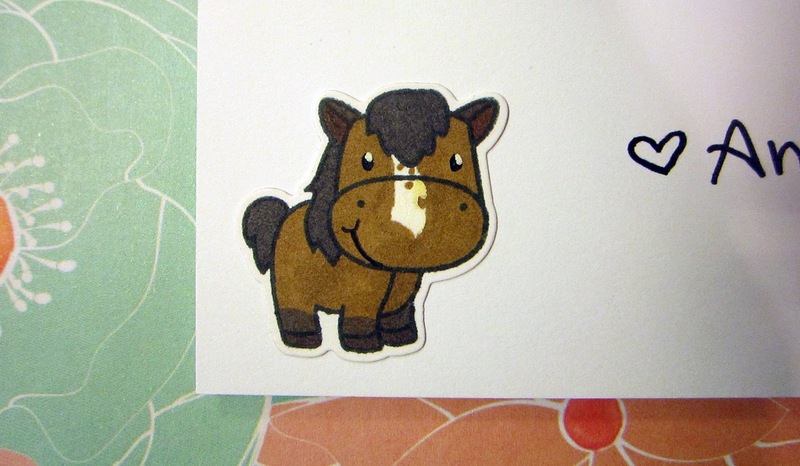 Our barn's color theme is black/white/red/gray, so I based the card's colors off of that. Fortunately I had the perfect ribbon! 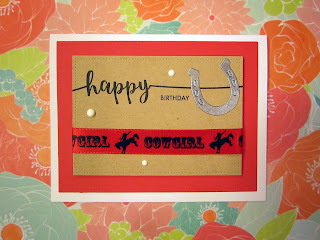 I die cut the horseshoe from gray cardstock that I'd turned metallic with Nuvo's embellishment mousse. I am addicted to that product! The horse shoe was kind of a humorous inclusion for me, because Wrangler is kind of notorious for losing shoes close to the end of his shoeing cycle. He wears corrective shoes and can't be ridden barefoot. Here's a better look at that horse shoe. I really loved the shine! 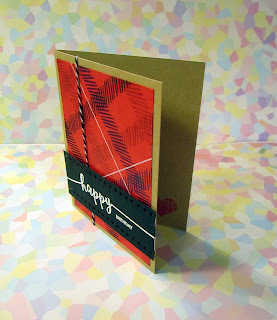 I used Nuvo drops to add the dimensional white dots, which I used to tie the kraft colored panel back to the white card base color. The top panel was raised up on foam tape for some more dimension, but it's not super visible in these angles. Sorry! Inside the card was a stamped die cut horse that I colored to look like Wrangler. Next up is the card for my grandpa! I stamped a plaid pattern onto red paper to make the background, my inspiration was thinking of old plaid work shirts. My grandpa is a practical, handy sort of guy, so I wanted to do something reminiscent of that. I used a small plus-sign border die to add some interest to the panel with the sentiment in on, because it reminded my of the tops of Phillip's head screws. My grandpa is very handy! I sprayed the whole panel with a shimmer mist to give it a more fun, cheerful feeling. I wanted to make the card masculine but not too drab, so hopefully I was successful there. 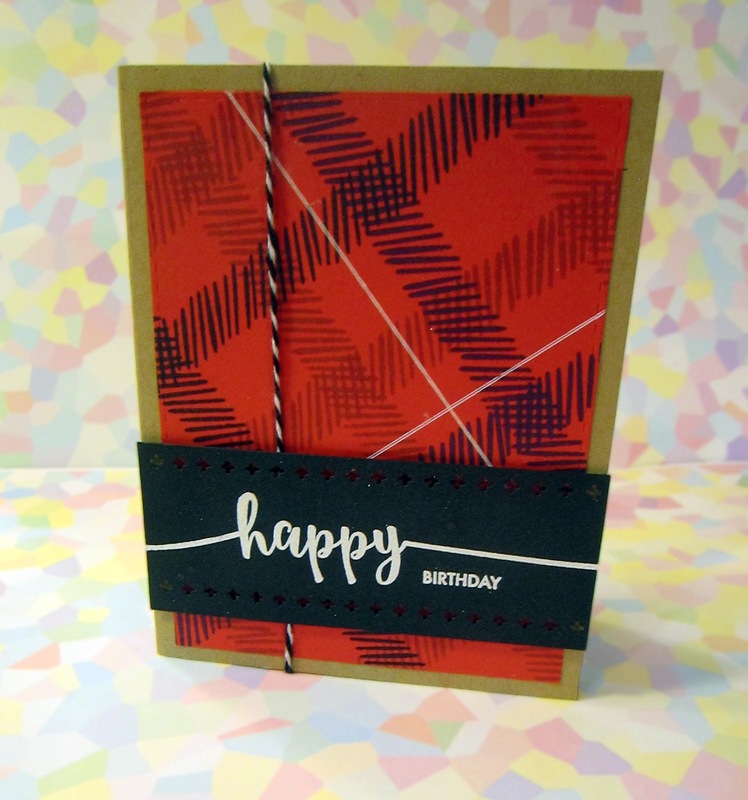 Inside the card is a stamped red plaid heart, to tie into the patterned paper I used on the front. You can see the stamped heart peeking out from this angle. 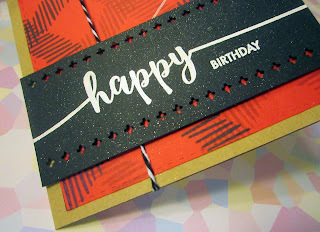 The birthday sentiment panel is raised up on foam tape, and there's some baker's twine running perpendicular to it.